I was pleasantly surprised when I recently updated my Chromebook to the latest version of Chrome OS (version 54 at the time of writing). Whenever I do an update, one of the first things I do is go into the accessibility settings to see if any new options have been added. In the latest version of Chrome OS, Google has provided a number of visual supports that I am finding helpful as a person with low vision. For example, there is now the option to enable additional highlighting (a red circle) when the mouse cursor moves. This kind of additional visual cue makes it much easier for me to use the interface. Highlight the mouse cursor when it’s moving: the cursor will be surrounded by red circle whenever it moves. There is already an option to enable a large cursor, but that can cause problems whenever you are trying to check a small box (as often happens on dialog boxes). With this additional highlighting added to the mouse cursor I can still find it on the screen even if I need to temporarily set it to its default size. Highlight the object with keyboard focus when it changes: this is really helpful when interacting with form fields. Whenever a text field or other form element gets focus it is surrounded by a thick yellow border. Highlight the text caret when it appears or moves: adds a blue circle around the text caret. I did not find this setting as useful, maybe because there is not much space between the text caret and the highlight. New animation for auto-click: as the circles get smaller, this indicates how much time is left before the auto-click takes place. There is some room for improvement with these visual supports (for example, the option to change the colors), but overall I think this is a good addition to Chrome OS. The options for highlighting the moving cursor and keyboard focus are going to always be turned on on my Chromebook. Out of all the amazing accessibility features built into my Apple devices, the ones that are most meaningful to me are those that are intended for people with low vision. These are the features I use most frequently since I still have some vision left and I am not a full time VoiceOver user. 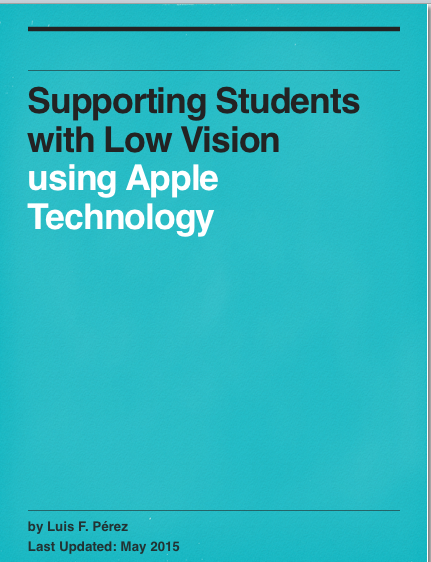 To share what I have learned about these features with the rest of the educational technology and assistive technology communities, I have authored a new multi-touch book: Supporting Students with Low Vision with Apple Technology. I had hoped to have the book available on the iBookstore in time for Global Accessibility Awareness Day, but with more than 25 videos that needed captioning it took longer than I expected. I am providing a sneak peek of a work in progress available for download from my Dropbox account. A word of caution: the file is 345 MB due to the videos. The book explores the concept of an ecosystems approach to accessibility which I discussed in my Global Accessibility Awareness Day post. It focuses not only on the accessibility features found throughout the Apple ecosystem (on iOS, Mac, Apple TV and even Apple Watch), a number of apps to designed to meet the needs of those with low vision, and techniques for creating more accessible content for low vision readers.